Excellent condition. 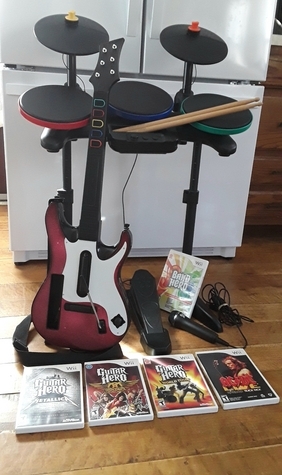 Includes wireless guitar with strap, wireless drums (the better kind with full cymbals vs the original ones) with drumsticks, microphone, foot pedal and Band Hero Game. Also included are 4 more games: Guitar Hero Metallica, Guitar Hero World Tour, Guitar Hero Aerosmith, and AC/DC Rock Band Track Pack. Only sign of wear I see is a small nick in the front of the guitar, which isn't even noticeable unless you're looking for it.Like new condition at Amazon is $359+ with shipping and only the 1 game.